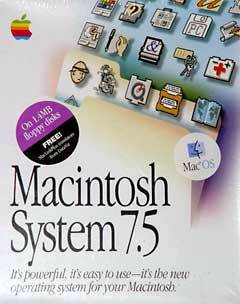 Here at Restorations HQ, we really like System 7.5.5. It has the right balance of vintage feel, hardware compatibility, and modern data exchange capabilities. It runs on almost everything* from the Mac Plus to the Power Mac 9500/180MP, a range that includes most of the models we’re interested in – and it’s free. Much has been said about software that supposedly works on Mac OS 7.6 but not on 7.5.5. These claims are patently absurd: 7.5 and 7.6 are practically the same. Except for a few bug fixes and speed improvements for Power Macs, everything in 7.6.1 is present in 7.5.5 as well. Please don’t get me wrong: I like Mac OS 7.6.1 very much, and I don’t mean to knock it. My desire is only to show that System 7.5.5 isn’t out of the running. Microsoft Internet Explorer has a mixed history as a Macintosh application. In the early 1990s, before the Browser Wars, early IE versions were naught but enhanced versions of NSCA Mosaic. As competition between Microsoft and Netscape heated up, the choice between IE and Navigator became a critical divide in a conflict of almost religious zeal. With each new version, Internet Explorer became more and more Windows-like, to the disappointment of many Mac users. Internet Explorer 5 for Macintosh was a dramatic change from that trend. With it, Microsoft beat Netscape in offering progressive rendering technology. This made IE 5 dramatically faster than either IE 4 or Navigator 4. Another revolutionary feature of IE 5 for Mac was the new interface. It was very modern at the time and intuitively Mac-like. Consequently, it was much more popular than previous versions of IE. Internet Explorer 5.1.7 running on System 7.5.5. The last release of IE for the classic Mac OS is 5.1.7. Microsoft discontinued support for Classic afterward, choosing to focus on Mac OS X. The Microsoft website cites security concerns and no longer offers a download of Internet Explorer for Mac. Version 5.1.6 can still be downloaded from Tucows. Installing Internet Explorer onto a Power Mac running System 7.5.5 couldn’t be easier. You will need to have your 7.5.5 updated with the newest features, as detailed on my personal site. Once your System Software is ready, simply drag the Internet Explorer folder to your hard drive. When you first run the program, it will automagically put all its parts where they need to be. 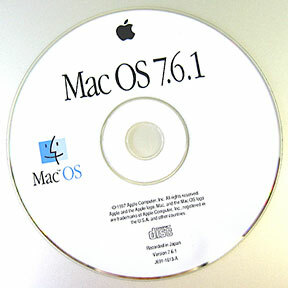 Is Mac OS 7.6.1 required? Not at all. Another great Mac application that has been said to require Mac OS 7.6.1 is the venerable SoundJam MP from Cassady and Greene. Before the days of iTunes, SoundJam had a virtual lock on the Mac MP3 market, despite being a US$50 commercial program. It was so good that Apple bought it outright and used it as the basis for iTunes. Unfortunately, the SoundJam MP installation procedure isn’t quite as simple as that for Internet Explorer. When launched, it quits with a message that Mac OS 7.6.1 is required. Is this because of some missing feature in 7.5.5? Not even! SoundJam looks for OS version 7.6.1 or later. SoundJam MP’s affinity for Mac OS 7.6.1 is completely artificial. When it starts up, it asks the Mac for the version of the current System Software. If that number is less than 7.6.1, SoundJam simply winks out. Fortunately, this type of check is easy to fool. Using ResEdit to change the VERS resource. By simply adjusting the version number listed in the ‘VERS’ resources of the System Suitcase, we can fool SoundJam MP into thinking it is running on Mac OS 7.6.1. This can be accomplished in about ten seconds using ResEdit. For those who are squeamish about delving into their Mac’s innards, I have provided a patch. SoundJam running on System 7.5.5. As with Internet Explorer, it is important to bring your System 7.5.5 up-to-date before installing SoundJam. The principle illustrated by IE and SoundJam couldn’t be much clearer: There’s nothing that Mac OS 7.6.1 can do that System 7.5.5 cannot. Even a program that explicitly checks for 7.6 works fine – once it’s tricked into running. What about all the newer software that ships with 7.6? Doesn’t that make it far more convenient than 7.5.5? Not really. To get the most mileage out of 7.6, it’s necessary to install the 7.6.1 Update, Open Transport 1.1.3, LaserWriter 8.5.1, AppleShare Client, Appearance Manager, and the appropriate version of QuickTime. Sound familiar? That’s practically the same as the list of updates I recommend for System 7.5.5. If you’ve been considering Mac OS 7.6.1 but can’t find a CD, give System 7.5.5 a whirl. All you’ll be missing out on is the fancy new installer, updated Extensions Manager, and hassle of finding that darn CD. Mac OS 7.6.1 is a great version, but 7.5.5 users shouldn’t let anybody tell them they’re behind the times. * Exceptions: The PowerBook 1400, Power Mac 4400, and clones using the Tanzania motherboard can run System 7.5.3 but are not compatible with 7.5.5.